SLASH is back with his signature electrifying riffing and high-wire, lyrical solos. It’s been four years since we last heard new music from SLASH. 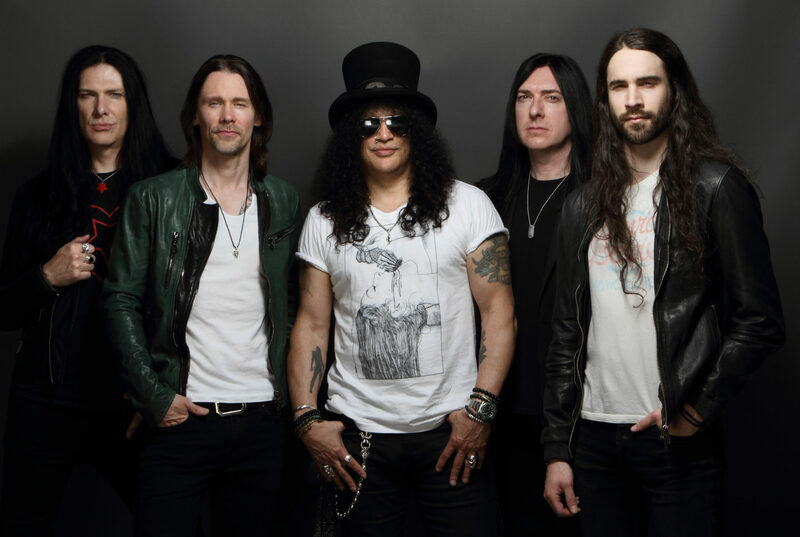 After an 18-month, 20-country world tour in support of the second SLASH FT MYLES KENNEDY & THE CONSPIRATORS album, 2014’s World On Fire, it was announced the guitarist would rejoin Guns N’ Roses in an historic reunion after two decades away. Since then, SLASH and his Gn’R band mates have crisscrossed the globe on multiple arena and stadium jaunts, playing to millions of fans the world over on what has been a record-breaking tour. “I always planned on getting back together with the Conspirators as soon as possible, and continuing on with what we started,” he says. LIVING THE DREAM packs a compendium of sounds and styles into 12 tightly arranged and sharply executed tracks. LIVING THE DREAM, the new full-length offering from the group—which, in addition to SLASH and singer KENNEDY, also includes bassist TODD KERNS, drummer BRENT FITZ and, making his recorded debut after several years of live work with The Conspirators, rhythm guitarist FRANK SIDORIS. The album, their third overall following World on Fireand 2012’s Apocalyptic Love, is possibly the band’s strongest collective statement to date. Event Time: Doors 6:30 p.m. / Show 7:30 p.m.
Public on-sale: Friday, February 8 at 10 a.m. MST. Venue pre-sale (Edmonton): Thursday, February 7, 2019 at 10 a.m. to 10 p.m. local. Password: (DREAM). SiriusXM pre-sale: Monday, February at 10 a.m. local to Thursday, February 7 at 10 p.m. local. AMEX pre-sale: Tuesday, February 5 at 10 a.m. local to Thursday, February 7 at 10 p.m. local. Fanclub pre-sale: Tuesday, February 5 at 10 a.m. local to Thursday, February 7 at 10 p.m. local. Password: (SLASH19). Spotify pre-sale: Wednesday, February 6 at 10 a.m. local to Thursday, February 7 at 10 p.m. local. Password: (SMKC19). Live Nation pre-sale: Thursday, February 7 at 10 a.m. local to 10 p.m. local. Password: (SINGLE). Live Nation Mobile App pre-sale: Thursday, February 7 at 10 a.m. local to 10 p.m. local. Facebook pre-sale: Thursday, February 7 at 10 a.m. local to 10 p.m. local. Password: (LIGHTS). Ticketmaster pre-sale: Thursday, February 7 at 10 a.m. local to 10 p.m. local. This is a general admission, all ages show. This tour does not offer meet and greet.